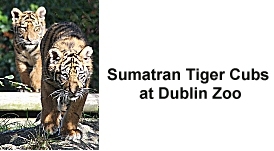 Dublin Zoo is rightly regarded as one of the best city Zoos in Europe and rightly so. It is a large, modern, efficient and very well run facility and is a popular haunt at all times of the year for both visiting tourists and native Dubliners. The very popularity of the Zoo can also be one of its disadvantages. On a sunny Saturday or Sunday it can get very, very busy. The first thing to do then is to book a ticket online - this is important as the ticket-office queues can be very long. Get a ticket online and save yourself a whole load of hassle. Of course if you arrive early enough then this should not be a problem. The Zoo opens at 9.30am, closing at 6pm in Summer but earlier in Winter. There is a fine restaurant and Zoo shop so once inside you can enjoy your visit in comfort. The Zoo hosts lectures, photography camps and much more - be sure to check out their website in advance of your visit - a little planning here will go a log way to enhancing to your visit. The Zoo is located in Phoenix Park and is very well served by buses. The Luas tram stops at Heuston Station and is reasonably near but if possible arrange your transport all the way into the park. If you drive into the park then there are car parks available but you are advised to get there early to claim one or else you will be parking a fair walk away. Phoenix Park itself is well worth a walk around especially in fine weather so an ideal itinerary would be to get to the Zoo early, have lunch in the restaurant and then have a stroll around the park which boasts Farmleigh House (a free visitor attraction), although it is a fair walk across the park from the zoo. It is not recommended that visitors walk to their city hotel or accommodation from the park. Get a taxi or bus and save yourself the trouble. A fine map of the Phoenix Park can be found at http://www.farmleigh.ie/media/Tourism.pdf.